Free download BusinessCards MX latest version. 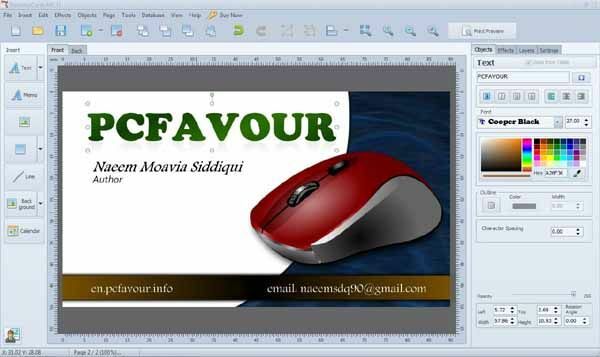 It is a professional business/visiting cards designing software by Mojosoft software. BusinessCards MX or Business Cards MX is really nice, easy to use and light software. It has built-in templates as samples to design the cards. The designing of business cards may be processed in two ways using this software. The one and the easiest way is using wizard. In which user just need to select a category of the card from the list given in software as Auto, Cars, Computers, Flowers, Technology and more. Each category contains several samples of the design. The user may select any desired sample. In the next step, you’ll just need to type the information about the card’s owner in the given boxes. The software automatically changes the sample data with the given information. The other 2nd way is normal designing method. Just select a sample and edit it yourself as you want. You may change color, background, font style, font size and other images manually. The trial version of BusinessCards MX contains small number of samples or templates. However, the purchased version provides more attractive and lots of samples to design a business card. BusinessCards MX saves the designed cards in BCW format. However, you may also save it in image form by exporting the file as image. The software also supports CMYK colors. The software contains enough tools and effects to design a business card. The good thing about BusinessCards MX is that it has several predefined templates listed by the categories. The user may choose the desired one. And the more useful thing is that the user is completely free to edit the predefined template as changing of backgroud and other images, font type, style, blur, shade and other designing techniques.